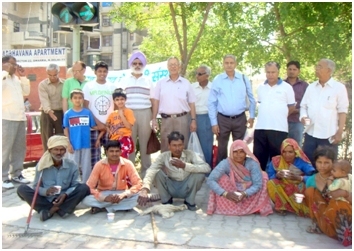 On 6th April 2013 morning, the public passing through the main road between Dwarka sectors-22 and 23 observed with surprize anenchanting scene of several senior citizens busy in cleaning the footpaths in friendly association with the staff of South Delhi Municipal Corporation and Horticulture Department of Delhi Development Authority. It was an enthusiastic group of the members of “SukhDukhKeSathi”, the association of senior citizens for social welfare,who decided to undertake this noble task. Capt SS Mann of the association co-ordinated for this job with neighbouring residential societies and the officers and staff of SDMC/DDA and finally succeeded to organize a splendid programme with attractive gathering of SDKS members, residents and workers of Sadbhawna and Chitrakoot Apartments and a significant number of officers and staff of the civic bodies. Shri Rajesh Bharadwaj, Sanitary Inspector of SDMC, personally monitored the whole job and passed instructions to Shri Mukesh- the supervisor of the area. On the other hand Shri KK Bhalla, President Chitrakoot Apartments, monitored working of his gardener and Safaiwalas so also that of the Sadbhawna Apartments in this endeavour. Officers of DDA also encouraged their staff. Shri Bharadwaj further agreed happily with the request of SDKS members for similar special sanitation and cleaning drive on each Saturday from 8.00 am to 11 a.m. in the area, in co-ordination with “SukhDukhKeSathi”.The workers engaged in the job felt honoured when the SDKS members invited them fortee/snacks and promised to work in future with full vigour. Jan Lokpal: On Sunday, We March!